The first and so far only visit to New Zealand by a Bishop of Rome was significant for Catholics and the wider community. The Polish-born Pontiff had arrived in Auckland the previous afternoon. He received a state welcome at the airport before celebrating Mass in the Auckland Domain. The Pope flew to Wellington that evening and stayed at the Apostolic Nunciature (Vatican embassy) in Lyall Bay. On Sunday 23 November, the Pope had several meetings with dignitaries before presiding over a 2½-hour Mass for 25,000 people at Athletic Park. ‘Only Wellington’s wind marred proceedings, making microphones roar, billowing the pope’s vestments and blowing over a crucifix, a microphone stand and a music stand’, the Dominion reported. Next morning he flew to Christchurch, where he held an ecumenical liturgy at the Catholic cathedral and celebrated Mass at another sacred New Zealand venue, Lancaster Park, before flying to Canberra. The 66-year-old John Paul II made a circuit of each outdoor venue in a specially designed ‘Popemobile’, a vehicle with armoured glass created after an assassination attempt in 1981. 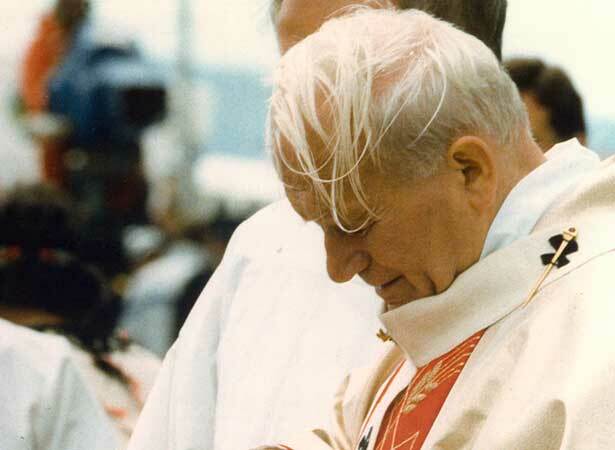 We have 14 biographies, 8 articles, related to Pope John Paul II celebrates Mass in windy Wellington .